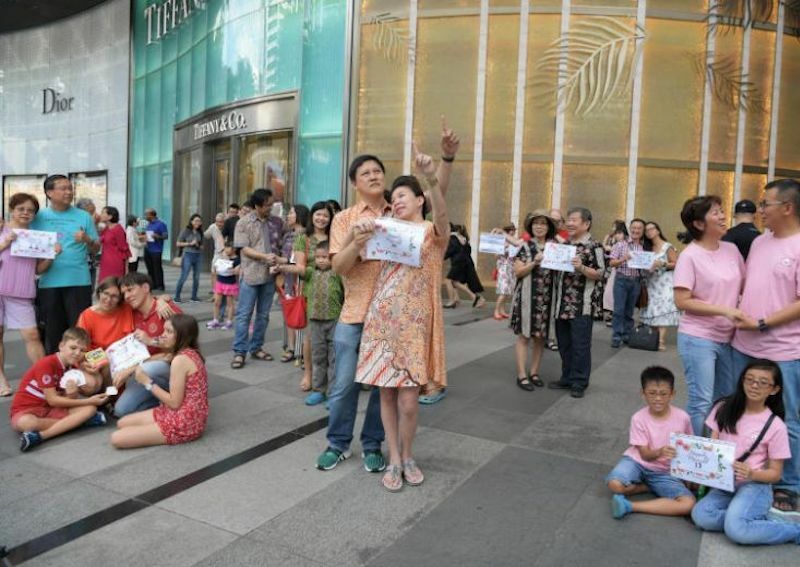 Mr William Wee and his wife Nancy posing as part of a "freeze mob" outside ION Orchard on Feb 10, 2019. SINGAPORE - For five minutes on Sunday (Feb 10) amid the hustle and bustle of Orchard Road, Mr William Wee, 80, held his wife, Nancy, 79 and the couple "froze" in that pose for five minutes. With one arm over her shoulders, Mr Wee was looking at his wife lovingly. "The most important thing for me in a marriage is to love and bring joy to one another," said the retired navy officer. The couple, who have been married for 58 years, was among 280 people who "froze" in different poses at 5pm outside ION Orchard shopping mall to celebrate World Marriage Day which is observed on the second Sunday of February every year, just before Valentine's Day. The flash mob event was organised by Worldwide Marriage Encounter (Singapore). "We wanted to encourage strong marriages with this initiative. We realise that marriage is not an easy journey with the increasing divorce rates and challenges that couples today face," said Christina Bong, coordinator of the non-profit body. "Strong marriages are the foundation of strong families," she added. Marriage Encounter was formed by a Catholic priest who created a series of conferences for married couples in Spain in 1952. Since 2011, the Singapore chapter of the pro-family initiative has been celebrating World Marriage Day with a flash mob event. It runs programmes for married couples. Many other countries including Australia, Belgium, Ecuador, Guatemala, Italy and Spain have held similar flash mob events to celebrate World Marriage Day. Passers-by on Orchard Road who were puzzled by the scene on Sunday only had to read placards that read: "Please do not be alarmed. Just happily married couples having fun." One participant, Mrs Priska Marina, 27, who got hitched four months ago, said that marriage has opened her eyes to a world of understanding. "So far our wedded life has been wonderful. We learnt to be transparent with each other and do things together," said the branding executive.